Nearly half of the coal produced from federal land in Wyoming is initially sold to subsidiaries of companies that mined the coal, helping those entities avoid paying a royalty to the government. New rules proposed in December aim to address the loophole. To address the loophole, the Office of Natural Resources Revenue proposed this week changes in how coal companies operate at first point of sale, aiming to curb companies’ captive transactions. The new rules address "regulations governing valuation for royalty purposes of oil and gas produced from Federal onshore and offshore leases and coal produced from Federal and Indian leases." A 60-day public comment on the proposal began this week and will end on March 9. Coal companies say the proposed rule changes would ultimately reduce the amount of coal being mined, thus reducing royalty payments overall. In the largest coal-producing state in the US, more than 40 percent of coal that comes from public lands is sold by five of the largest coal companies working in the Powder River Basin to one of their 566 shell subsidiaries that will then sell the product, according to a new report by the Center for American Progress. These deals, called “captive transactions,” are part of a strategy to effectively avoid federal and state royalty payments and taking full advantage of tax subsidies from the US Department of Interior. Federal law mandates that coal companies pay a 12.5 percent royalty, according to Wyoming Public Media, to the government on the first sale to another company of coal mined on public properties. Coal can then be sold many times before ending up with a power plant or utility. Yet, with a network of hundreds of subsidiaries, coal companies can sell to their own entities or partners, thus paying royalties based on artificially low prices. Much of the coal is exported based on falling demand. “Increasingly, the major coal companies are selling Powder River Basin coal not on an open market, but to an elaborate network of shell companies that they own and control,”said Matt Lee-Ashley, a senior fellow and director of the Public Lands Project at Center for American Progress, in a press release. ...Yet captive transactions in Wyoming have jumped 17-fold since 2004. 40% of WY #coal now being sold by companies to themselves. “Additionally, the massive subsidies given to the coal industry, through reductions in royalties due to financial hardships and deductions for transportation and washing, will remain in place,” the organization said in calling for tougher rules on how royalties are assessed at the final point of sale and how subsidies are awarded to the industry. Most of the land in the Powder River Basin is owned by the federal government, and much of the coal mined there is shipped overseas, according to Grist.org. “Over the last 30 years, this has amounted to a $28.9 billion subsidy to the coal mining industry and helped coal maintain its large share of US electricity generation by keeping coal prices artificially low,” Smyth wrote in 2012. “These low prices have also helped the Powder River Basin soar from just 5% of US coal production in 1970 to almost half today — even though the Federal Government no longer classifies the region as a coal-producing region. If this sounds absurd, that’s because the BLM’s process for leasing US coal is skewed to benefit coal mining companies, lacks proper oversight and public participation, and is basically corrupt,” he added. A recent report by an environmentalist think tank details further this relationship between companies and the government. 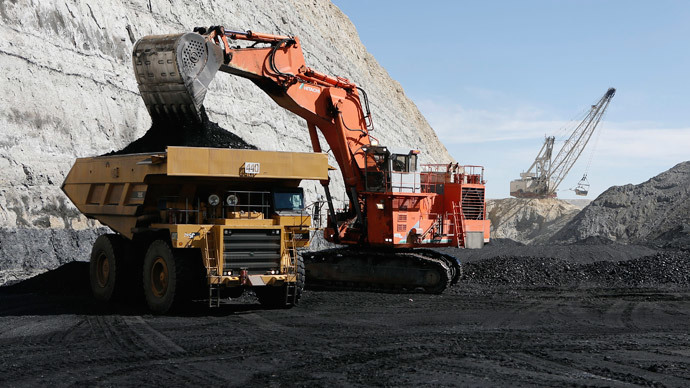 “Although a growing share of federal coal is exported to overseas customers, the BLM has almost completely ignored the value of export sales when determining the minimum price it will accept for federally owned coal,” according to the Sightline Institute.